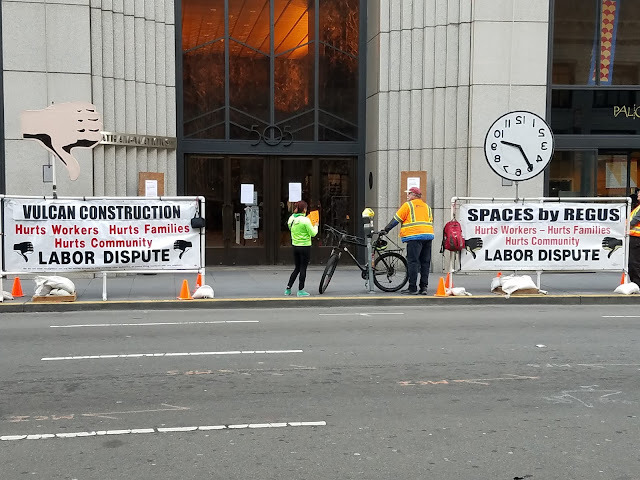 The above picture shows union members protesting recently in San Francisco's financial district on Montgomery Street. One has to ask though: Do these type of protests really hurt the businesses targeted? Spaces is a new hip office space provider created by Regus to compete with WeWork. I had no idea that they were putting office space at 505 Montgomery. I think it is more of an advertisement for Spaces than anything else. The same for Vulcan Construction. I had never heard of them before but they must do quality work if Spaces is using them and they must be cheap since they aren't employing union workers. I can recall several years ago when I was walking on Market Street past San Francisco's Westfield Mall and a similar protest was occurring. The protest was aimed at a high-end grocery store that was on the lower level of the mall. I had no idea it was located there until I saw the protesters. I went in, checked it out and became a regular customer. It may make sense from a union's perspective to protest a business that is visible from street level but if it is not, the protest probably creates a lot more awareness for a business and more customers than anything else! I always had a laugh when I saw the 15 foot tall inflatable rats the union guys would put in front of buildings they were protesting in NYC. I am somewhat surprised, that one of those signs isn't in Spanish.